Thanks to the kids at O Henry Middle School in Austin for these origami-folded letters. 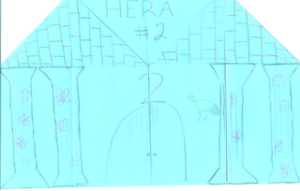 The students designed them so they are decorated like Camp Half-Blood cabins on the outside, and when you fold them open there are letters to the author inside. What a great idea for a class project!